Moon sextile Neptune natal makes for a feeling and touching person. Your ability to connect with others at the emotional level can make you very alluring. You can be a sultry and very attractive person, a smooth operator. When researching celebrities with this aspect I found more famous people than with any other natal aspect. This is a sign that Moon sextile Neptune can make you very successful and popular, even famous in your chosen field. This magnetic attractiveness is just one reason for your popularity. You tend to have strong morals, and are honest and very genuine. However, sharing and caring in such a way can leave you vulnerable to being taken advantage of. This should only be a small risk though, as you tend not to attract negative people. This aspect offers a level of spiritual or psychic protection. A rich imagination and dream life can give rise to many creative talents, such as poetry, dance, painting, singing and acting. You are a people person so whatever your chosen field, you should be around others. You will however, need your own quiet place to dream up your projects and not be distracted. Besides artistic pursuits, any role in which your empathy is required would suit you well, such as work in non-profit organizations, charity, or customer relations. 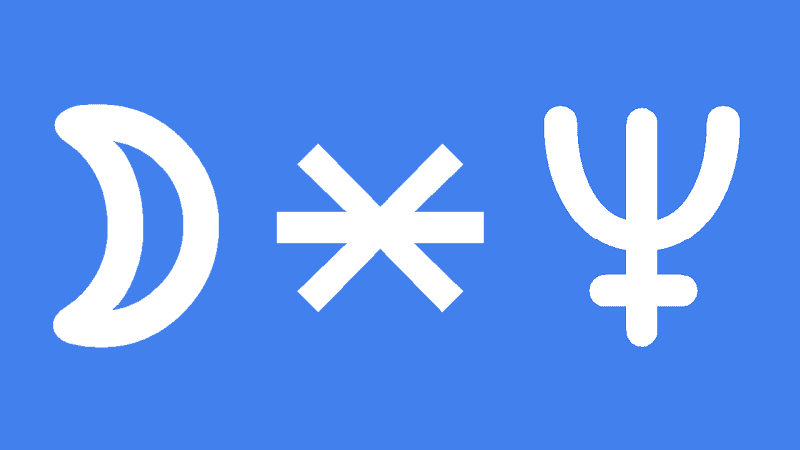 Moon sextile Neptune transit heightens your level of sensitivity and emotions. You will be more in touch with the feelings of other people and with your environment generally. Any negative energy will be strongly felt, but this transit suggests you will enjoy the company of pleasant people and be in nice surroundings. Your intuition and psychic abilities will be stronger and more accurate than usual. Dreaming and imagination will be more vivid and creative. This is a good time for meditation, lucid dreaming or remote viewing, or any other spiritual or occult activities because you will enjoy a level or spiritual or psychic protection. This transit is especially good for artistic and creative pursuits. Your strong imagination allows you to give tangible form to vibrational energy, to be touched, seen, felt or heard. A good sense of rhythm and tone is excellent for dance and music. Good qualities like compassion, trust and loyalty are triggered now. These, together with a mystic allure and sultry attractiveness will have a favorable impact on your relationships. You can connect at a deeper level with your loved ones, especially family members, partners and women in general. This interpretation for Moon sextile Neptune transit applies to a lunar eclipse and full moon sextile Neptune. Brian Edwards 0°02′, Julie Newmar 0°04′, Alessandro Moreschi 0°04′, Kenny Anderson 0°06′, John Gotch 0°08′, Sandra Bernhard 0°10′, Henry Ford 0°12′, Geraldo Rivera 0°13′, Elsie Wheeler 0°14′, Carl Wilson 0°20′, Johnny Depp 0°24′, Jeffrey Archer 0°24′, Queen Anne of Great Britain 0°29′, Zenna Henderson 0°31′, Ennio Morricone 0°32′, Kenneth Branagh 0°34′, Julie Andrews 0°52′, Captain William Bligh 0°52′, George H.W. Bush 0°56′, David Spade 1°07′, Edith Piaf 1°12′, Florence Griffith-Joyner 1°14′, Johnny Cash 1°20′, Kim Carnes 1°25′, Gordon Ramsay 1°43′, Jules Verne 2°29′, Shirley Temple 2°49′. What is the date and for how long is the transit felt? Only for a few hours with Moon transits. The Moon travels at one degree every two hours. As with all transits, it is more potent when applying. what if the moon is with pluto in scorpio and square mars? Moon square Mars is the main aspect to be concerned about. It is possible that your illness could have led to some inner resentment and anger at the subconscious level for him.